It has been a long time since my last post and I’ve been chastising myself for weeks. But the reason for it is the tangible uptick in the real estate business here. Sales activity is looking up in terms of volume although prices are generally staying level. In the wider picture though, requests for appraisal services has improved dramatically over the previous year, vacation rental and boat bookings are generally stronger than 2013 and overall the economy in Abaco looks to be doing much better. I would almost hazard to say that the things are starting to look quite rosy here. Anecdotally, there has been a few properties that have sold in the past 6 months at full asking price after having 2 or more serious persons interested. I haven’t seen that happen in years. As I have written before the condo market dam has broken and sales volume is gaining serious ground. There is great value to be found in the condo market right now so it just makes sense. A recent sale in Hope Town set a new price record for a single family estate on the cay – “Oasis” was acquired for $5.5M at the beginning of this year setting the bar for residential real estate on the cay. Interest in Treasure Cay has risen since the recent announcement (i.e.“leak”) into the papers about a serious potential for sale of the remaining development holdings as well as the marina and resort components. Nothing is certain but the party from Vancouver has been in due diligence since 2013 and things maybe looking positive for a sale. If this happens the market there should improve significantly. I’ve been saying for a long time that the community needs some fresh energy at the helm. The restaurants and hotel are looking run down, the Spinnaker Restaurant hasn’t been altered (not even the drapes) since the 1980’s – time for some sprucing up? In other recent news around the island, the new airport is promised to be commissioned and open this month, April. So we all wait with baited breath on that one. A company called IJet charters was trying to start a seaplane service that would deliver you straight to Hope Town, bypassing the MHH airport and the taxi and ferry rides. A great idea and was well received by many residents, homeowners and visitors, however it seems there is a bit of opposition from the government side. The hurdle will have to be overcome. I can’t stress how important a service like this would be for Green Turtle Cay. Ever since regular flights have pretty much ceased into Treasure Cay Airport, it has become a major trek for residents and visitors to get to GTC. One must fly to Marsh Harbour Airport, then take a 40 minute car ride (or $85 taxi fare) to the GTC ferry dock and then ferry over. Basically this adds $85 and almost an hour to the travel time to get to GTC. Not good. But if there was seaplane service that dropped your right to the Green Turtle Cay Club, how great would that be? And GTC’s economic outlook all of a sudden looks worlds brighter. Lastly, the GAFFW (swim, run, tri, fun) was another great success in its third year. Tomorrow marks the end of the sailing season in Abaco, being the Homer Lowe regatta for Opti’s and Sunfish. After this, the Hope Town Sailing Club which hosts the races will be losing most of its membership (winter birds/second home owners) until they return in Novemberish. On the other hand everyone is looking forward the summertime Regatta Time In Abaco with the corresponding ‘Fiddle Cay Stranded Naked Party’. Almost forgot – Alburys Ferry service started offering a new service taking passengers to Lubbers Quarters (finally) and between HT and MOW and HT and Guana Cay. I hope it catches on. And so the gears slowly turn and Abaco slowly develops and slowly becomes bigger and better. The big question is do we want it to? Or do we want it to stay the secret paradise that it is? 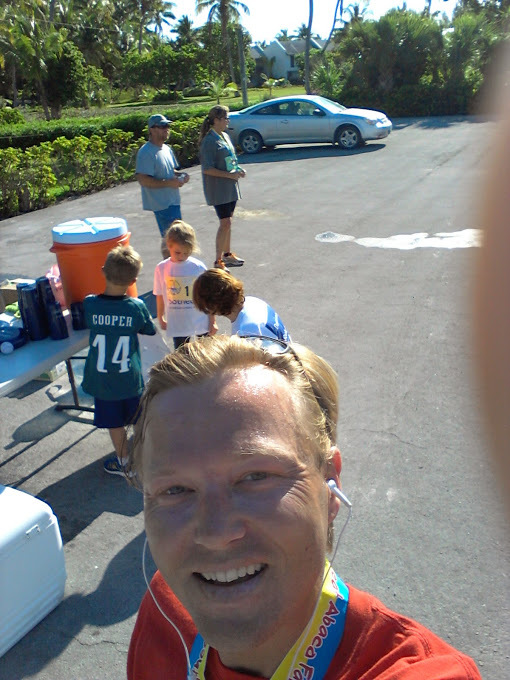 ^^ My ‘selfie’ after the triathlon relay I took part in, filling in as runner and got my time under a 10 minute mile. How many properties in the Bahamas Real Estate market Never Sell?